Shandon Language Solutions (SLS) was established in 1992 to provide English language tuition for foreign students. We specialise in placing foreign students in Irish primary and secondary schools for both short and long periods of time. The students attend school with Irish pupils and study the subjects in the Irish National Curriculum. We also facilitate some students wishing to study the International Baccalaureate. Over the past number of years we have also offered English language courses combined with work experience placements. Participants begin with a period of general English classes and then they spend some time on work experience, working for an Irish business in a variety of sectors. All students are provided with a full guardianship / support service during their stay in Ireland. Most stay with Irish host families organised by our accommodation officers. We also have several academic year students attending boarding schools. SLS owners, Donal & Kathy Donovan also have many years’ experience operating an English language summer school. From the summer of 2013 SLS began operating its own summer school based in Oatlands College. This camp has proved to be a huge success combining General English Classes, 4to1 Intensive Classes and also Rugby and Basketball Specific courses combined with English Classes. As of 2014 SLS’s summer school is fully ACELS accredited and in July 2016 SLS became a member of Marketing English in Ireland (MEI). SLS offices are located in Heritage House, Dundrum Office Park. 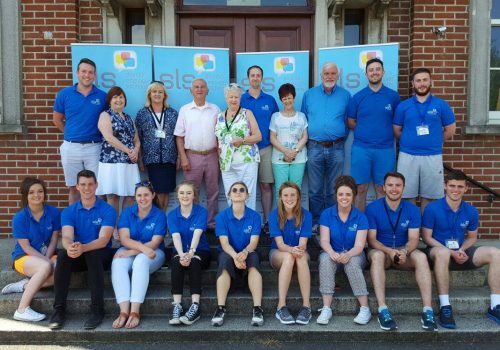 If you would like more information on SLS Ireland or any of SLS’s programmes please contact us on info@slsireland.ie.